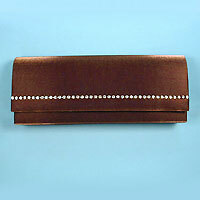 Satin clutch purse with gold framed rhinestone flap. 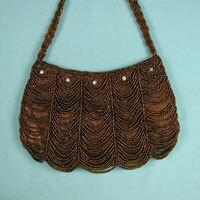 Includes a magnetic clasp and a medium 27 inch shoulder or hand satin cord. Color: coco. Hue: soft brown. color code: #9C7200. 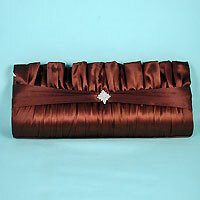 Measurements: width 8", height 3", depth 1-3/4"
Satin evening bag clutch purse. The flap on this purse is fashioned in a tucked design. The tucks are secured with small rhinestones in a flower motif. It includes a matching shoulder cord with a 22 inch drop, has a snap closure and is lined in satin with a back pocket. 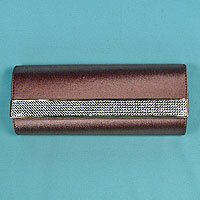 This is a lovely clutch bag for any special event. Color: brown. Hue: pecan. color code: #6A2A00. Measurements: width 9½", height 4", depth 2"
Color: brown. Hue: amber. color code: #9C5F00. Long sparkle satin clutch bag with multicolored rhinestones, beads and sequins. 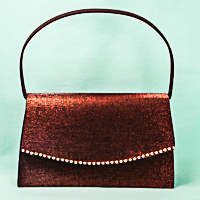 This is an elegant and bold evening bag or handle bag with rows of multicolored large rhinestones in several shapes and size. It is lined in satin with a side pocket, has a metal frame with a kissing ball clasp closure and includes a beautiful retractable beaded handle with a seven inch drop. Color: brown. Hue: tobacco. color code: #9C7D00. Measurements: width 11", height 4", depth 2"
Color: brown. Hue: sable. color code: #6A4100. Type: silver. Color: brown. Hue: sable. color code: #6A4100. 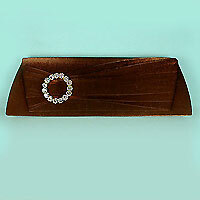 Long sleek pleated satin evening clutch bag crystal rhinestone decoration. 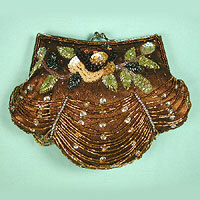 This is a beautiful evening bag with just the right rhinestone accent. The silhouette is wider at the bottom than the top and the flap is narrower at the bottom. Across the flap is a band of fabric gathered near one side with a ring of rhinestones. It includes both a matching snap-in satin handle and shoulder cord, is lined in satin with a side pocket and has a snap closure. This clutch fetching. 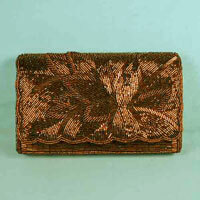 Measurements: width 12", height 3-3/4", depth 1½"
Faux snake clutch purse with crystal rhinestone clasp. 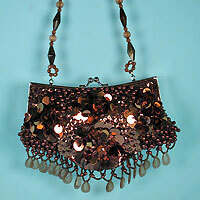 Includes a matching metal shoulder chain which folds in the purse. The chain has a 24 inch drop. Color: brown. Hue: Cognac. color code: #6A5500. Type: gold. 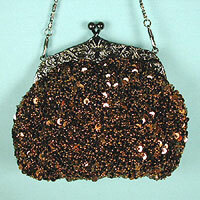 Measurements: width 7½", height 3", depth 1½"
Round satin purse with sequined and beaded design. 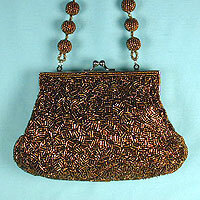 Includes a beaded handle. Measurements: width 8", height 6", depth 1½"
Color: brown. Hue: Cognac. color code: #6A5500. Type: sparkle�satin. 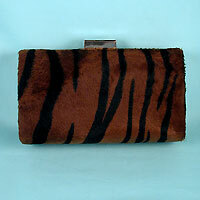 Small animal print evening bag clutch purse or cute purse for daytime. There are two styles. The first has a striped black and brown design with a with silver metal frame, a retractable shoulder chain and a push snap closure. The second has a black and white cow design with a removable matching handle and a kissing clasp. They are made of faux fur and lined with an inside pocket. 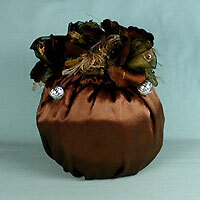 These cute little purses work well for day as well as evening events and accommodates a mobile phone. Measurements: width 6", height 3½", depth 2½"